You can add several virtual desktop hosts to your farm that can be used to publish virtual desktops. Note: The checkbox next to the server name indicates the particular server is available to users on this farm. To disable a server temporarily, uncheck this checkbox. To manually add a host to your farm click the Add button and then choose a VDI Type and enter the Host name or IP address in the VDI Host field. The VDI Agent property should point to the Appliance. Click Next to continue. Parallels Remote Application Server will check whether VDI Agent is installed. 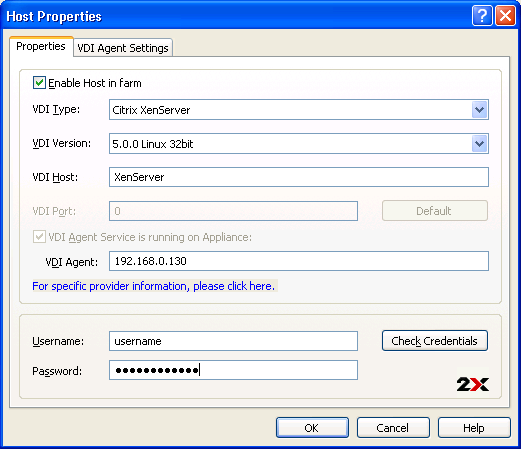 Check the status and if the status states that the Agent did not reply or the service is not installed, click the Install button to install VDI Agent. The status will also indicate that an update is required if the agent version is different from the current version. Click on the Update button to update the agent to the current version. An appliance needs to be initialized if it was deployed for the first time. If the status indicates that initialization is required, click on the Initialize button to initialize the appliance. Click Next, if the status states that the Agent is already installed. To enable this host in the farm, make sure that the Enable Host in farm checkbox is checked. Select the VDI provider of the host from the VDI Type field and the version that you are using from the VDI Version field. 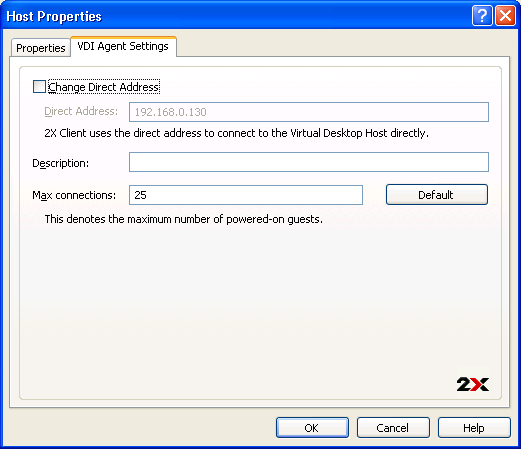 To change the Host name or IP address of a particular VDI host, use the VDI Host field. The VDI Agent property should point to the Appliance. To start using the new host, please enter the username and password of the host. Click on Check Credentials if you would like to test the username and password before clicking OK.
You can configure the direct address by checking the Change Direct Address checkbox and type a new direct address. This address is used in Direct Connection mode only (this is an internal or external IP address) depending on where the clients will be. If external, the IP addresses must be assigned at your firewall to your servers). A Description can be given to the host which can be used to easily identify different servers from one another. Next you can type the maximum number of powered-on guests you want this host to accept. 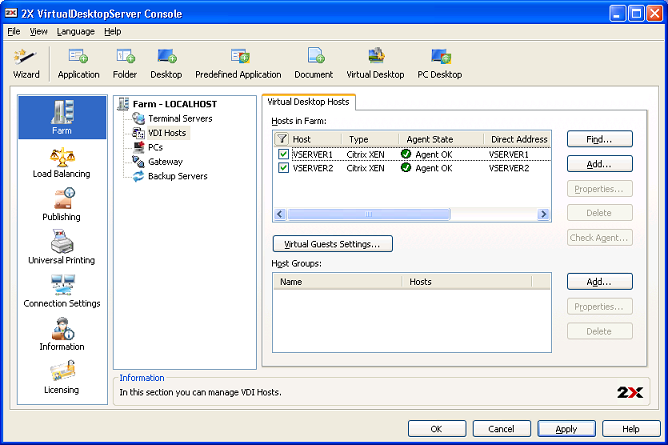 Note: Make sure that VDI Agent is installed on each virtual desktop host added to the farm. VDI Agent collects the information required by Publishing Agent to be able to load balance each session according to available resources. To start publishing the applications, select Publishing from the Navigation bar and click the Add button from the Publishing tools. From the Select Type dialog choose Desktop, and from the list of desktop types chose Virtual Desktop. Note: If only one server is listed in the Virtual Desktops Hosts list, the wizard will skip the Publish From dialog and continue with the Application Settings dialog. 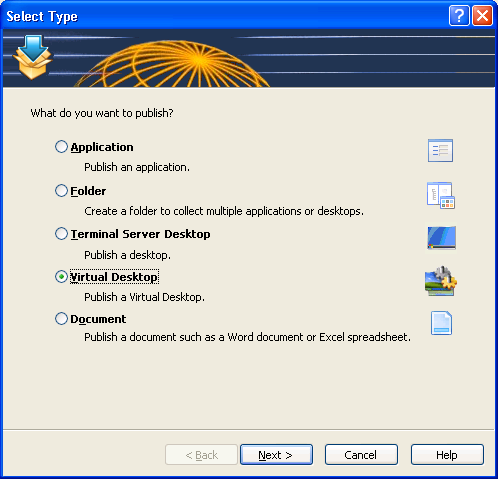 In the Publish From dialog you can choose from which Virtual Desktop Host/s you want to publish the virtual desktop. 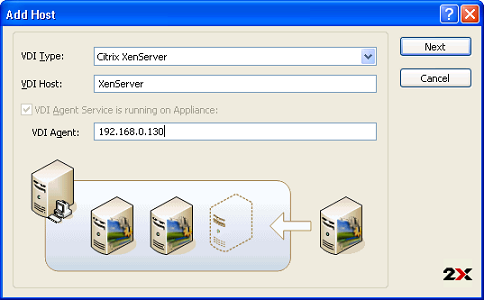 You can choose to publish the virtual desktop from All Server in Farm, from Server Groups or from Individual Hosts. In this dialog you can type the desktop name and a description for the published desktop. From this dialog you may also change the icon for the published desktop. Any guest: will load any virtual desktop published to any user that logs in. 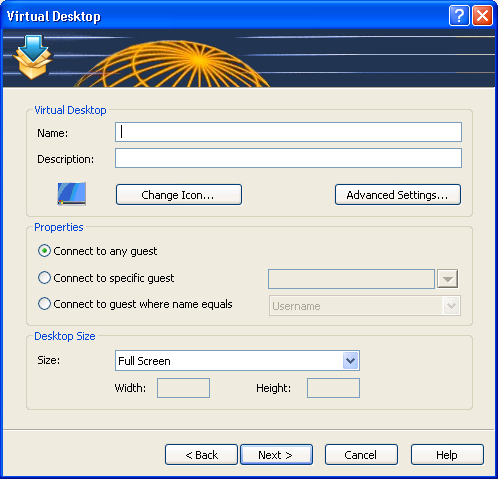 Specific guest: will load the virtual desktop selected to every user. Guest: will load the virtual desktop to users whose username is the same as that of the virtual desktop or to users which are using a machine that has an IP address equal to the virtual desktop’s name. Specific Template: will load a virtual desktop created from the specified virtual desktop template. If the Persistent checkbox is ticked, the user will always be connected to the same virtual desktop. Choose, from the drop-down list, the resolution you would like to use. Choose Custom to be able to enter your own resolution. Click Finish to finalize the wizard, and the application you’ve just configured will be generated in the Published Applications Explorer area. Now you can re-configure the options by using the tabs in the Published Applications Properties area.